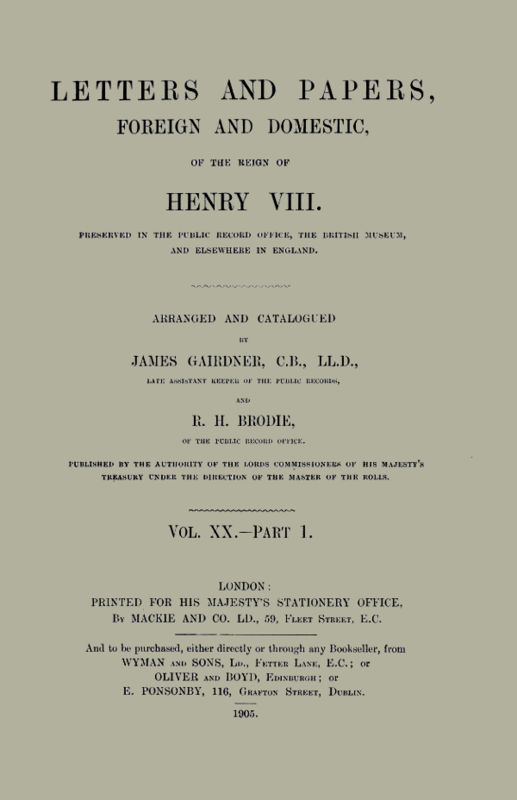 Letters and papers of Henry VIII, 1545. These letters and papers were transcribed and translated from the Latin by three men — John Sherren Brewer, James Gairdner and Robert Henry Brodie and published in 21 volumes between 1862 and 1932. This section of Volume 19 of the papers covers purchase and grant of land from the Crown in March 1544. Hugh Appare. Grant, in fee, for 339l. 15s. 7d. of the manor, rectory and advowson of the vicarage of Sutton, Heref.—St. John’s of Jerusalem and the preceptory of Dynmor, Herf. 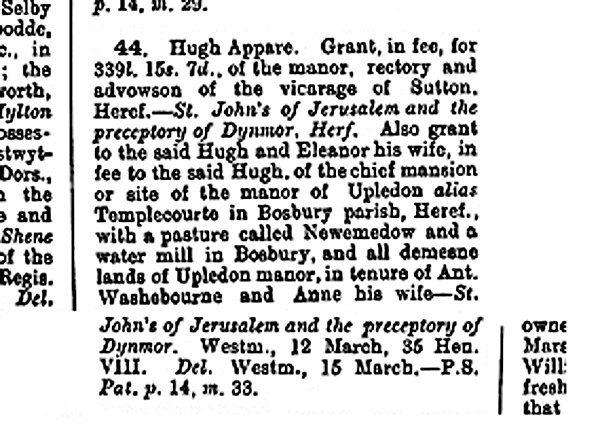 Also grant to the said Hugh and Eleanor his wife, in fee to the said Hugh, of the chief mansion or site of the manor of Upledon alias Templecourte in Bosbury parish, Heref., with a pasture called Newemedow and a water mill in Bosbury, and all demesne lands of Upledon manor, in tenure of Ant. 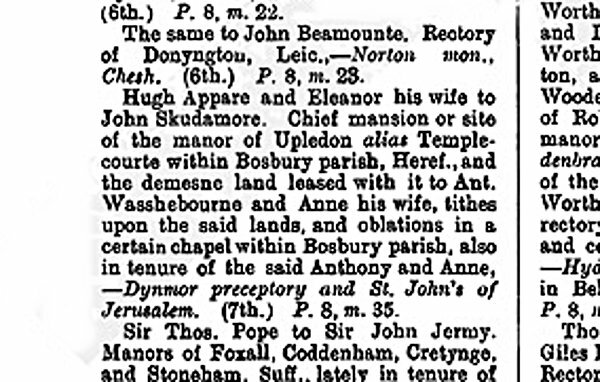 Washebourne and Anne his wife— St. John’s of Jerusalem and the preceptory of Dynmor. Westm., 12 March, 35 Hen. VIII. Del. Westm., 15 March.—P.S.Pat.p.14,m.33. This section of volume 20 of the papers covers grants made by letters patent in September 1545, sub-section 68. Licences to alienate [dated at Westminster on the day of the month given in brackets at the end; p. is part and m. is membrane]. A ‘Licence to alienate’ was Royal permission to sell or dispose of land given to the landowner by the Crown. The cover shown above is Volume 20 Part 1 but this extract comes from Part 2. Hugh Appare and Eleanor his wife to John Skudamore. Chief mansion or site of the manor of Upledon alias Templecourte within Bosbury parish, Heref., and the desmesne land leased with it to Ant. Wasshebourne and Anne his wife, tithes upon the said lands, and oblations in a certain chapel within Bosbury parish, also in tenure of the said Anthony and Anne —Dynmor preceptory and St. John’s of Jerusalem (7th) P.8, m.35. Information courtesy of The Internet Archive at htpps://archive.org and British History Online at http://www.british-history.ac.uk.